I can only speak from my own experience, but as soon as my son says, “Mom, what’s for dinner,” my head starts a routine of flip-flops. What do I make him? It has been a long day at the office, two meetings outside the office, a quick cup of coffee with a very close friend, an eraser to the mess in the house and now, dinner? Yep, dinner. Yeah, I am needed! But really, all I want to do is call for a pizza. But, I already did that two nights ago and I know it’s not going to fly today. So, I put my thinking cap on and search the cupboards and refrigerator for ingredients that will add up to some amazing meal that won’t take me long to make. Like most of us, I keep staples in the house, so it shouldn’t be too difficult to come up with something relatively quick and easy and NOT from a box. Although, a box of anything sure sounds better than cooking right now! But hey, how many more meals will my son want to spend with his mom? How many more opportunities will I have to make him his favorite food? Cook macaroni according to the directions on the package. In a saucepan, melt butter slowly over medium heat. Slowly stir in flour to make a roux. Slowly add milk to the roux and stir continuously. Add in all three cheeses and keep stirring slowly. Cook over low heat until the cheese is melted and the sauce is somewhat thick. 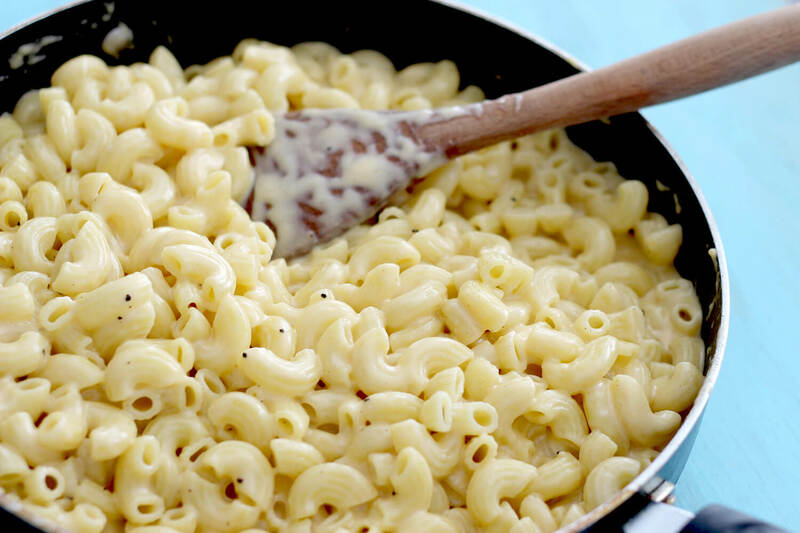 Put macaroni in a large casserole dish and pour sauce over the macaroni. Melt butter ¼ cup of butter in skillet over medium heat. Add breadcrumbs and brown ever so slightly so not to burn. Spread breadcrumbs over macaroni and cheese to cover. Take off foil and broil for 10 more minutes or until toasty on top. Sit down, have a conversation with your kid, eat and ENJOY!